One of our splendid readers alerted the hardreading staff to an interesting twofer in yesterday’s Boston Sunday Globe. 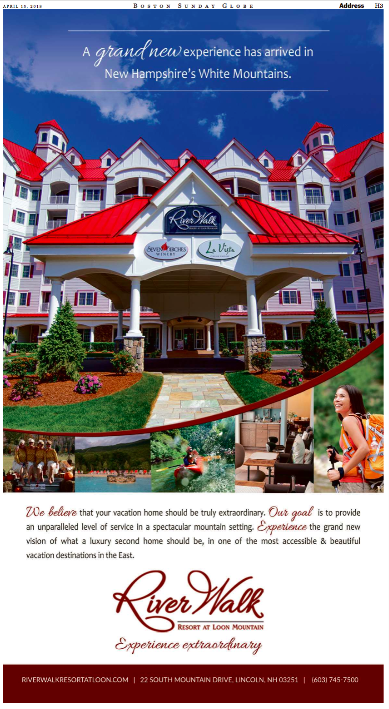 First, this “suspiciously glowing” review of RiverWalk Resort in New Hampshire, which ran on Page One of the Travel section. Then this full-page ad on page three of the Address section. Most certainly not, although not in the way you might think. We’re guessing the piece begat the ad, rather than the other way around. To be sure, the $tately local broadsheet has played footsie with its advertisers on numerous occasions, as the hardtsking staff has repeatedly noted. So we’re not saying pay-for-play is entirely out of the question; we just don’t think that’s the case here. This entry was posted on Monday, April 16th, 2018 at 3:41 pm and is filed under Uncategorized. You can follow any responses to this entry through the RSS 2.0 feed. You can leave a response, or trackback from your own site.